This is pure sugar and chocolate indulgence. 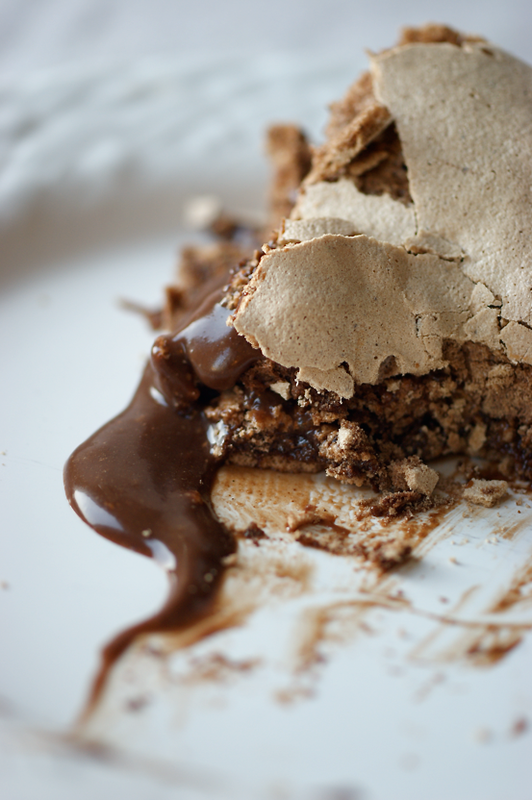 Just think about it: thick dusty discs of chewy but soft chocolate meringue sandwiched with smooth chocolate pastry cream made with double cream and lots of melted dark chocolate. I don't have a proper cake plate at the moment in Oxford, so I decided to improvise with a random selection of objects from my room: Sweet's Anglo-Saxon Reader, a tiny collection of Tennyson's poetry my great-grandfather gave my great-grandmother for Christmas in 1910 and a Tiffany's box. One thing I do now have here is a shiny new Magimix 5200. It's gorgeous and I've become unhealthily attached to it in the 72 hours we've had together. So far it's made perfect pizza dough, pancake batter and whizzed my tomato pizza topping. I wasn't entirely convinced that it could really whip whites into a glossy meringue - surely I needed something that actually looked like a whisk. 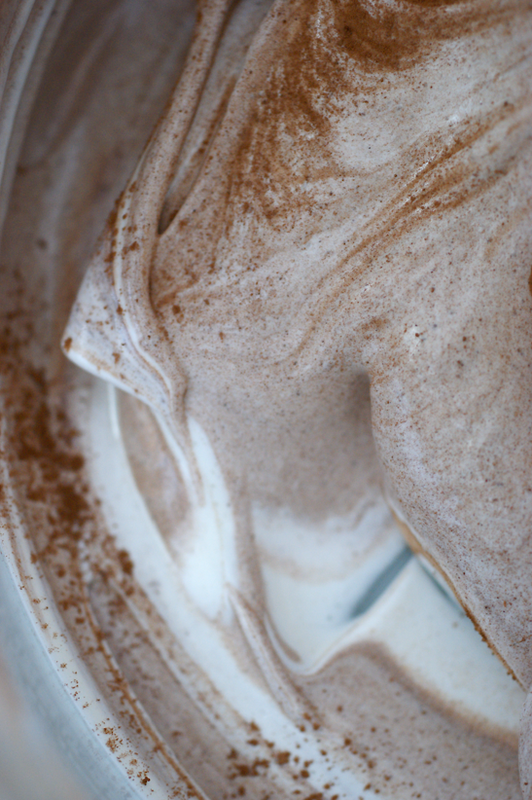 But no, the meringue I whisked in my Magimix today was the best I think I've ever made. Magic! 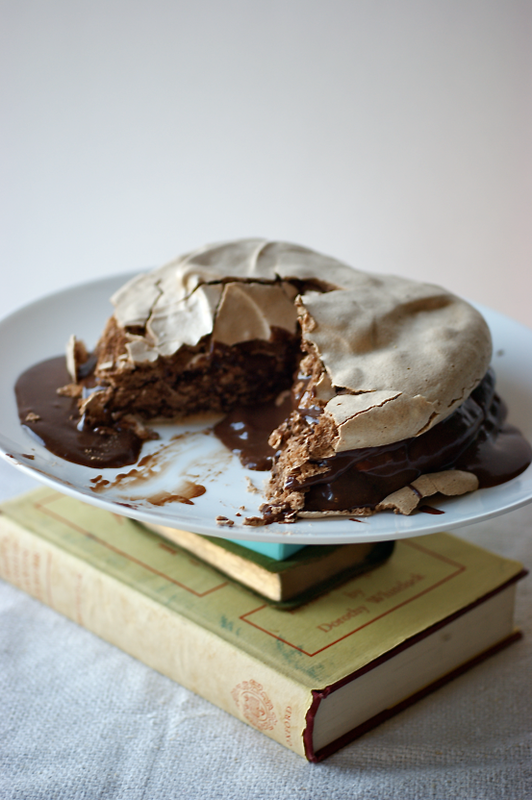 I made a few changes to Nigella's recipe: I halved it, I didn't use the cream on the top meringue or sprinkle it with nuts and I had to use balsamic vinegar in the meringue (which was surprisingly good). Preheat oven to 140C. Draw three circles with a radius of 7cm on parchment paper and place on baking sheets. 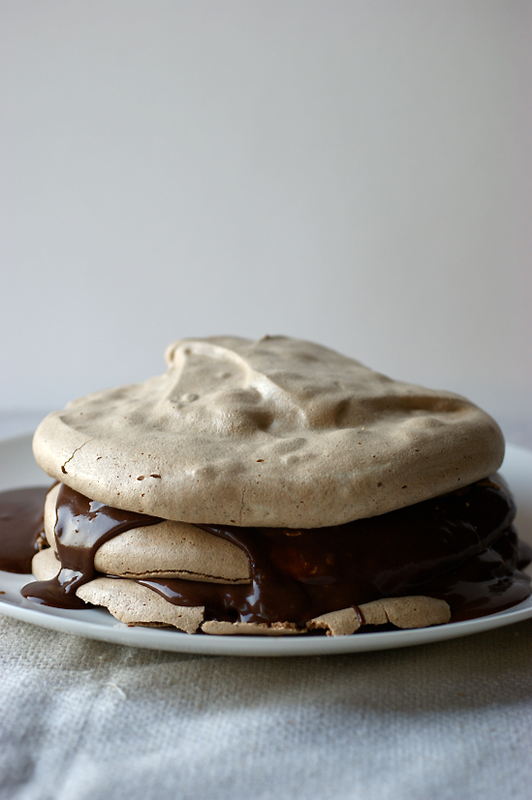 Whisk the egg whites until fairly stiff, then very gradually add the caster sugar till you have a thick glossy meringue. Sift the cocoa powder over the top and add the vinegar/lemon then fold in until homogenous. Divide the meringue between the three circles and spread them out evenly. Put into the oven for 45 minutes before turning the oven off and leaving them in there to cool. Kept in an airtight tin separated by parchment they will keep for a week or so. Beat the egg yolks and sugar together, then add the flour and cocoa and beat well to incorporate. Warm the cream and milk in a small saucepan then add half to the egg mixture, beating well with a whisk as you go. Return to the rest of the milk/cream mixture in the pan and whisk again. Bring to the boil, stirring constantly until it thickens. Take off the heat and stir in the chocolate and vanilla essence. Once combined, remove to a bowl to cool, topping with greased baking parchment to stop a skin forming. Don't put it in the fridge. When the pastry cream is cool, put one of the meringue layers onto the serving plate. 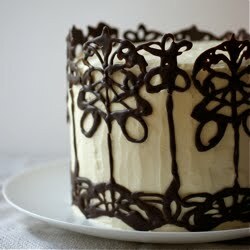 Smear the top with pastry cream - I used about a third. Top with the next layer and squish slightly. Top with more pastry cream and then the final layer. Nigella smears the top too and adds nuts, but I decided to keep it plain. I would try to eat it the day it's served. My god that looks goooood! Congrat on being featured on tastspotting! My teeth hurt just looking at it! But oh, what sweet goodness it must be! By the way, what exactly is a megamix? More than a blender obviously. Is it like a vitamix? Your "cake tray" looks great! Very creative indeed. Jessica - a Magimix is a food processor. It chops and blends and slices and juices and now whisks and even kneads dough. It's a french brand I think. My mum's one has been going for 18 years! Oh my your desserts are incredible! 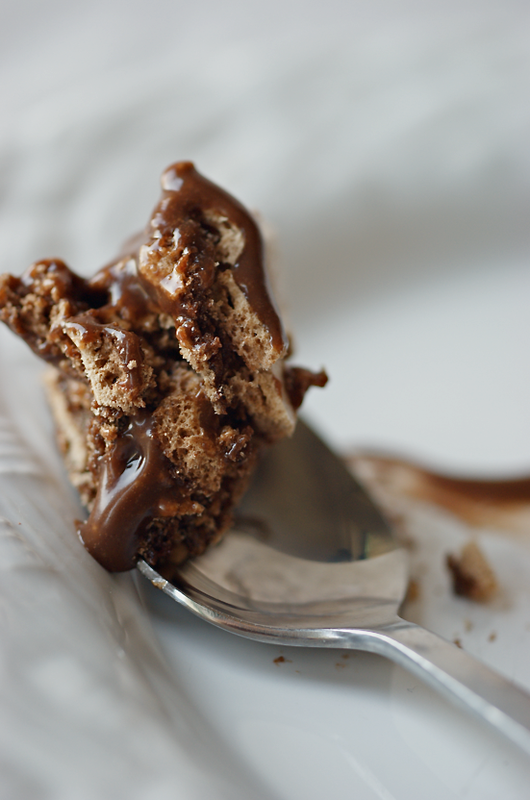 That oozing chocolate is dreamy. I can't wait to see what you make next. WELL DONE!! This looks AMAZING!! oh boy! 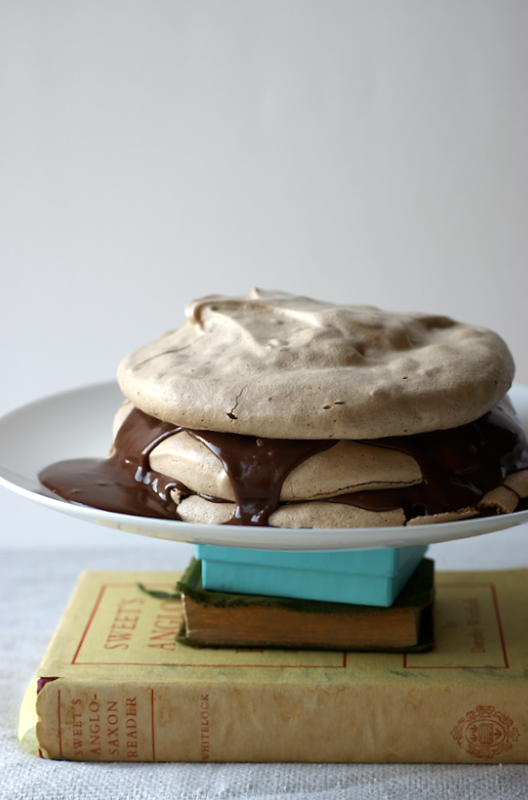 i've never thought to put meringues in a stack and eat them like a cake before, but i really have to try this now! 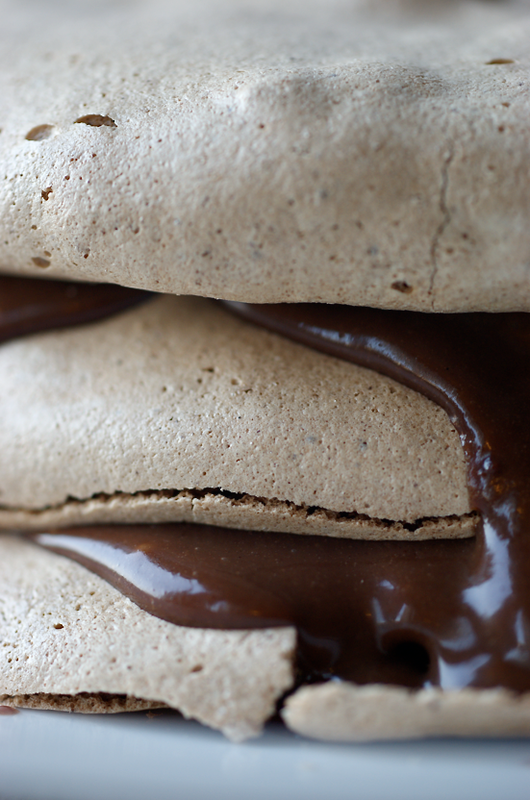 the gooey chocolate looks amazing. Looks so delicious. I really want to try making this chocolate pastry cream but I'm confused as to when you add the 50g of chocolate? Oh dear! Sorry for the confusion, I think I added it in once it was off the stove, along with the vanilla. I'll adjust the recipe now. I hope it goes well for you!